The historic roots of the True Crime genre can be seen in publications like True Detective Magazine (1924-1995) and the Notable British Trials book series (83 volumes, 1905-1959). The publicity that accompanies True Crime stories makes such tales especially popular with publishers. A recent addition to the True Crime shelf is Blood & Volume by Dave Copeland. The title of Copeland's book comes from a request that two federal agents made when they were interrogating the book's protagonist, Ronald Gonen. Gonen had just been arrested in New York City for massive drug dealing and was "spilling his guts" to the authorities in an attempt to avoid life in prison. "We have to investigate everything you tell us about, Ron," said one agent--"and frankly, you're telling us too much! So please just give us blood and volume." By "blood" the agents explain to Gonen, they mean they want to hear what he knows about murders--not about more mundane break-ins, assaults, fraud, or burglaries. And by "volume," the cops mean drug deals--but only really big ones! Don't burden us with investigating smuggling and selling grams and ounces--we want mega-pound and mega--kilo deals only, and big honking suitcases full is best. Who was this handsome fellow, sitting handcuffed in a Manhattan interrogation room, telling the police the story of his life and criminal career? Ron Gonen was born in Russia to a small-town Jewish family who emigrated to Israel. In Tel Aviv, Gonen began with petty theft and graduated to burglaries, robberies, and dealing in stolen property. After his army service, he moved on to international cocaine and heroin smuggling, and served several years in prison in France and Germany. In the 1980s Gonen landed in New York City, where he and a dozen other expatriate "Israeli Mafia" criminals carried on in a grand gold-chain disco lifestyle--stealing, whoring, doping, and robbing (a la Goodfellas) throughout the Five Boroughs. When he was finally arrested by the feds, Gonen, with a young child and an addict wife, faced decades in prison. He made a deal to inform against his dealer/thief/murderer colleagues in return for a light sentence and a new identity in the federal Witness Protection Program. His information sent a dozen people to prison. 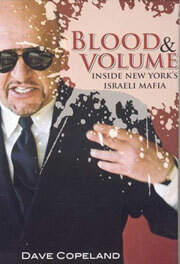 True to its title, Blood & Volume includes a goodly number of bodies (Gonen denies killing anyone himself) and plenty of edgy international drug deals involving hundreds of pounds of cocaine and heroin--not to mention some multi-million-dollar jewel heists and even insurance fraud schemes. The brutality, debauchery, and paranoia of Gonen's criminal lifestyle has a special poignancy: Gonen stole cars to go back and forth to his Israel army service. This amazing and bizarre story is told in a tight, polished narrative.